"Nearly a third of world's cacti face extinction," assessed by the International Union for the Conservation of Nature (IUCN) in 2015. Cacti are a vital component of arid ecosystems, providing a source of food and water for many animals, such as insects, reptiles, mammals and birds. In returns, these animals help distribute the seeds of localized cacti to a wider range. However, 31% of the world's 1,478 cactus species are subject to the threat of increasing human activities on the previously isolated arid habitats. To survive extreme heat, Cacti generally evolve to be slender or thin plants with a stem of small diameter or thickness but often with a tall size. Among these cacti groups, some can be as small as one centimetre in diameter, while some others can grow to a height above 19 metres (62 ft). These ratios of width to height naturally make them weak to abrupt physical forces; also their expansive roots are shallow and do not penetrate deep into the ground. For example, a 50-year-old Saguaro cactus of 4 metres (12 feet) tall has shallow lateral roots radiating of same dimension of height from the stem in the upper few centimetres of surface oil. Furthermore, cacti take years or decade to grow from a tiny seed of a few millimeter size into a sizeable plant. Cacti have very colourful flowers and they are very desirable as ornamental plants indoors. IUCN concludes that many cacti species are threatened by illegal removal of whole live plants and unscrupulous collection of seeds, besides the loss of habitats due to the change of land use. Small cacti are common and inexpensive at garden markets in North America, Europe and other affluent regions; nevertheless, rare or big cacti are expensive and they are targeted by poachers and illegal traders. The plants are dug up from their protected habitats and are shipped out globally, for example a rare plant of Ariocarpus can be worth more than US$1,00 each. Due to illicit trades, one of the endangered species is Echinopsis pampana with a drop of at least 50% in population in Peru. At this moment, Peru and Mexico have some success in combating illegal trade of cacti, although IUCN would like to enforce the strict regulations in other countries, such as Uruguay, Brazil and Chile, as outlined by the Convention on International Trade in Endangered Species (Cites) In the United States, Arizona has strict rules over its part of Sonoran Desert which extends to Mexico and the state of California. The striking landmark plant, saguaro cactus, is not listed as threatened, but Arizona has strict regulations about the harvesting, collection or destruction of this species on both public and private lands. 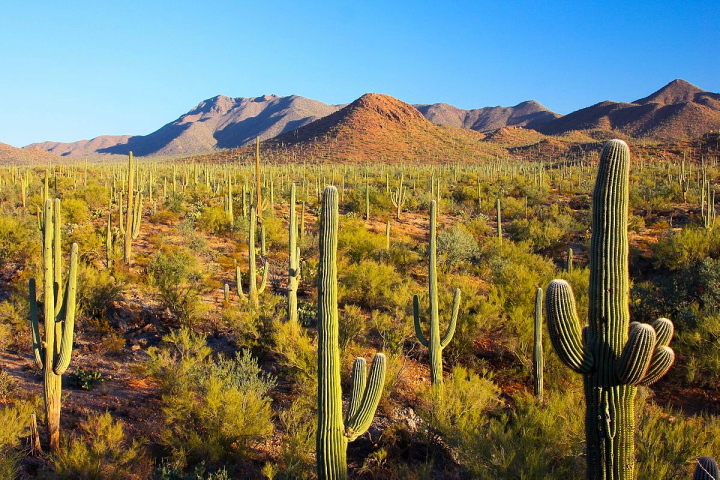 Saguaro cacti have taken over 100 years to grow to the mature height of 12 metres (40 ft). However, these magnificent plants still suffer from thoughtless vandalism and accidental damages. All in all, more efforts should be stepped up to make the public aware of threat of extinction of these silent and slow-growing organisms.